Arcadia is a fairly basic two-dimensional shoot'em-up in a fixed setting, much like Space Invaders, Gorf, Galaxians and Galaga, but unlike its arcade counterparts, this one was originally released on the ZX Spectrum and Commodore VIC-20. Your mission is to survive a 100 seconds, which all the levels will last, through 12 different levels of differently behaving aliens. After the 12 levels, the game will loop from the beginning, with no extra difficulty. The scoring of the game is a peculiar one: points awarded per alien destroyed are in line with the current level, as in one point for one alien in level one, four points for one alien in level four, etc. Although most games of the genre would have you recognise patterns and alien behaviours, in this one the alien movements had been given a good amount of randomness, in order to make it less predictable, and as such, more frustrating and difficult without being entirely too generic about it. Although the game can boast of quite a lot of simultaneous on-screen action, with a fairly good speed at that, I have to say it hasn't worked out as well as it should have. Every version of the game is glitchy in varying degrees and suffers from control speed problems, which are entirely relative to the amount of action on the screen. I can't say with good conscience that I like much of anything about it, other than the animated intro on the Spectrum version, which must have been something spectacular in 1982. But, if you're a fan of the genre, you might like that it's different enough from all the classic arcade shooters to have a few tries at it, and as such, it's a recommendable title. COMMODORE 64: v1 - 13 minutes 5 seconds, v2 - 13 minutes 11 seconds. Loading screens, left to right: Commodore 64, ZX Spectrum 16k, Commodore VIC-20. The exaggerations must have something to do with the fact that the briefly seen loading screen on the C64 says that you should wait for 18 minutes, when in fact the game loads in little more than 13 minutes. It's not even nearly the worst one we've seen on the C64, but it certainly reminds you of Atari 8-bit tapes. Since it is such a small game - fitting under 16k of RAM - it's no wonder that the two other versions load up so quickly, because the Spectrum and VIC-20 already had some slightly more sophisticated loading schemes at the time. If it's of any consolation to the C64 users, there's not much in terms of loading graphics on any machine. I already mentioned most of the gameplay elements and problems in the Description section, but there is one thing that makes the game really difficult: your space ship can only shoot two bullets at a time, one for each of your two guns, although most of the time, you will be shooting them both simultaneously. This gives the hordes of aliens a rather unfair advantage, since they can shoot up to four bullets each at a time, and more often than not, you will be trapped under a heavy rain. Luckily, you have the ability to ascend up to about halfway of the screen, which comes in handy, if you want to take a moment to breathe and rethink your actions. So, although it's a game more heavily based on dodging than shooting, you can think of it as having an element of strategy there. Controlling your spaceship is self-explanatory, if you have a joystick - you can use left, right, up and fire to their clearly defined uses. If you're using a keyboard, however, the controls will be of your own choosing from a pre-set number of choices. Moving left and right are placed on the bottom row of the keyboard in an alternating fashion - X for left and C for right, as an example. The key for thrusting is any one of your choosing on the second row, and the key for shooting is anything on the row above it. Having said all that, it is fairly important to have the Fuller box when playing the Spectrum version, because the game has a bug that makes your spaceship twitch around on its own free will and occasionally even shoot, if the Fuller box isn't plugged in. It's not unplayable without it, but it makes the game feel even more random than it is with one. Other than amplifying the normal beeper noises, this is the only real use it seems to have here. There are only two really important things that I can concentrate on, when comparing the three versions' gameplay differences. The first one is the behaviour patterns of all the twelve alien groups. Unfortunately, I am unable to tell everything by detail, for two reasons: I had to adjust the VIC-20's emulation speed to 50% so that I was able to get past level 1 (the bullets are nearly impossible to dodge in normal speed), and the aliens' behavioural variety past the very basic nature is so vast, that I had a hard time getting even to level 4 on either the Spectrum or the VIC-20 version, although it has to be said that the VIC-20 version has the levels in a different order. At least the C64 version includes the option to select your starting level from the first six levels, but it doesn't help much, since the chances are you are probably still going to die in level six at the latest, although there is a very slight possibility to get through the end of it. This explanation probably requires its own paragraph, but before I write it, I might as well say in conclusion of my playtesting, that after about a dozen plays on each machine, the furthest I ever got to in the game was on the Spectrum, to level 8 with the 45-degree-angularly falling diamonds (or dreidels, whatever you like to see them as). Also, another thing should be mentioned about the VIC-20 version: everything moves in a character-based manner, instead of smoothly by the pixel, so it's really difficult to judge the alien movements because you can see even less of the patterns they go by than in the other two versions. Now, the aliens always have a certain type of movement they do, but each alien in each group has their own personal way of doing it, which means that their falling patterns are always slightly chaotic. When the level timer hits 01, the remaining aliens fall down a lot quicker than normally, as they exit the level. In the Spectrum version, the exiting angle is steeper than their usual angle of movement, which makes it easier for you to judge their falling pattern and thereby, your safe spots. In the C64 version, their falling angle will remain exactly the same as it was before, which might make dodging the enemies virtually impossible, depending on the level and the aliens' patterns. This is why the end of level 6 can be highly potentially lethal. And, if you die at the end of the level, when the aliens are exiting, you will have to start at the beginning of the level. Thankfully, the graphics are insanely glitchy and flashy on the C64, which causes the sprite collision detection to be a bit more loose, and you might be able to get through falling aliens without a scratch. Only once so far, I have been able to get to level 7, where the aliens sort of charged at me straight on, and I died in less than two seconds. Randomness can be a wonderfully liberating thing occasionally, but in games such as this, it only causes headache and frustration. If it hasn't become clear yet, the most graphically pleasing part of the game is the intro, where available. 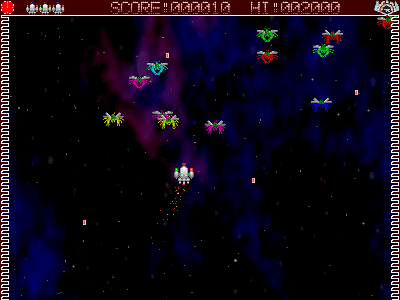 In the game itself, the programmers have tried to fit as many sprites on the screen as possible by making them appear at different times, causing some flicker, and thus making it possible for bullets, and on rare occasions even your ship, to pass through the enemies. But let's take a look at each version in turn, instead of lumping bits of them together. Once the SPECTRUM version has loaded, the screen will only show a flashing blue text saying "Press any key to begin", so you will not miss the fabulous intro by going to the kitchen and make some coffee while waiting for the game to load. Indeed, the intro bit is only shown that one time after the game has loaded - every time a game over has come, you will only get a flashing white text message saying something like "Press any key to start again", instead of getting the proper title screen. To be fair, it takes quite a while for the title screen to be fully drawn on the screen, so it was probably better to do it this way. So anyway, the proceedings of the intro screen are as such: first, the Imagine logo drops from above the top border to the top of the actual "paper" area, after which the text "Presents" appears below it, and then the ARCADIA logo starts to get drawn with a strange-looking font that tries to be 3D'ish - not like you would expect a loading screen to appear, but instead looking like as if someone was writing it on the screen. Finally, the rest of the text comes at the bottom of the screen, and one more instruction to "Press any key to begin". Unfortunately, you get no control menus or other instructions, so your only hope to know the controls back then would have been to own the original tape and look them up from the cover leaflet. 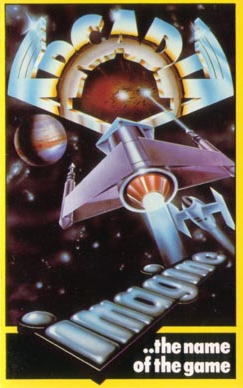 The game itself looks much like any other early 80's space shooter, except that it has some sort of side borders that have no actual effect on anything. There are 8 aliens on-screen at the most, all of which are single-coloured, but varied. Your own ship alternates between red and green, depending on your actions. There can be more bullets on the screen than there ever can be of other sprites, which also adds to the amount of flickering. Since there are so little of graphical variety as such, I see no point in including more than a couple of examples of levels in the screenshot compilations for any version. Screenshots from the Commodore VIC-20 version. Naturally, the VIC-20 version features the least amount of everything, and has no proper title screen after the loading screen - only a regular blank game screen with "Press any key", as is shown after every time your game is over. In the game, you get a more basically organised look than you get from any other version, but the movement and animations are sort of blocky and difficult to follow. The amount of basicness is very much shown in that the VIC version is the only one of the three not to have the extra borders, not that it had any use in the first place. Also, most of the graphics are single-coloured, but at least there are some multi-coloured sprites, such as your ship and a few of the enemies, so it's not completely bad. I suppose it could have been better, had it been made in exactly the same way as the Spectrum version. The C64 version has a completely different kind of an intro: first, you get this disco version of the game logo that appears in the C64 version of the game cover inlay, switching the effect colour in a rhythmic fashion. Second, on an otherwise empty black screen, the Imagine logo flickers at the top in pieces until it settles as a whole, and then the rest of the screen fills up with a bunch of options and a smaller logo of the game title. The level selection has an accompanied animated sprite of the enemy type featured in the level, which is a nice addition. The player selection also has some graphics next to the numbers - two yellow emoticons side by side, with player one always smiling, and player two frowning if it isn't selected. The control method icons are one joystick, two joysticks and a piece of the keyboard. If you wait for long enough, you can see one of the worst gameplay demos ever in any game. And finally, the in-game graphics on the C64 are superbly flickery and irritating to look at. Sure, they are definitely more colourful than on the Spectrum and even the VIC-20, but it just doesn't work. There are about the double amount of sprites on the screen as there are in the Spectrum version (and just to point out the flickering effect, the leftmost in-game screen you see above SHOULD have 12 enemy sprites), and the movement is slightly smoother, but the flickering is really annoying to look at. It's difficult to say which one is less unpleasant, the Spectrum version or the C64 version, because both have a certain amount of problems to suffer through. Both versions are pretty much as smooth to play, but the C64 has more graphics, and the Spectrum has less flickering. I suppose I will have to make them share the #1 spot this time. As strange as it may sound, I'm a bit divided here, even though there isn't too much to say about the sounds. Before getting into the other two, I might as well start with describing the VIC-20 version, which can be neatly done in a few select words: it's just basically random noises, with silence when nothing is happening. Now, the SPECTRUM version has a lot of very familiar sound effects from a lot of other early Spectrum titles, of which your ship's explosion is probably the most unique one of the lot. The in-game noises are comfortable and familiar to any Spectrum gamer, and are likely to be as fondly remembered as the soundtrack for The Last Ninja is to any C64 gamer. The intro sounds are familiar as well, but take a relatively long time to get through, and is my least favourite bit of audio in the game. In contrast, the C64 version has a very C64'ish soundscape, with very familiar early C64 sound effects in all the right places, which makes for a rich enough, but primitive environment. The most unique audio feature in this version is the short tune playing at the start of every new life, which is badly made, but sweet in a similar way to when a two-year old draws something which you can't make any sense of, but must be treasured because it's an early representation of a person's artistic endeavours. Endearingly horrible. Because the sound effects are a bit too much on the C64 and perhaps too little on the Spectrum, I will have to let them share the spot once again. It's just a matter of opinion, which one is the lesser of two evils. PeeJays Remakes: Arcadia - The Particle Experiment. If you want to have a less unpleasant moment with Arcadia, the best option is to try out one of these PC remakes, both of which can easily be considered retro by some people by now. Comments etc. are always welcome!